After we published our marketmap of Chinese payment providers, we received a lot of feedback and requests for data on other emerging payment markets. One of the most frequent locations we get inquiries about is India. While obtaining a license can be difficult, and there are still currency controls in place on outward remittances, many of the providers we talk are prepping to enter the market as they sense the country is on the verge of becoming a major outbound remitter. But it’s not exactly an open playing field – established non-bank providers such as Western Union, Moneygram, and UAE Exchange have long had physical presences in the country. New entrants face the dual challenge of luring customers away from banks and large incumbents, along with convincing them to use new technology. Below are the foreign transfer providers with the most service locations across India. While new, online providers have their eye on this market, they may face a steeper climb than expected. 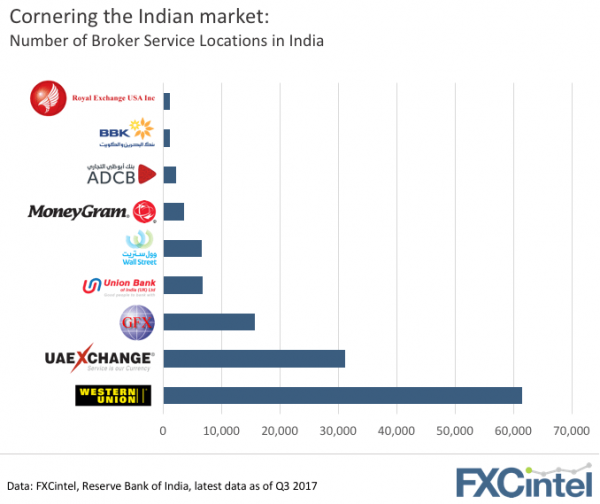 The sheer number of locations where Indian customers can access remittance services gives an indication of how rooted the Indian payment market is in physical, in-person transactions. Here’s a Transferwise ad we clocked on the NY subway back in July 2015, touting their UK-originating anti-bank message after they had just entered the US market (apologies for the quality, smartphone cameras have come a long way): And here’s the latest Transferwise ad we captured on the NY subway this past weekend: The switch to inspirational messaging speaks volumes. Not only does it highlight the cultural differences between the UK and US market, it signals the desire among fintechs to position themselves as trusted financial institutions with broader product offerings. This past year has seen a number of leading non-bank providers introduce bank-like services, including Moneycorp’s new banking license, World First’s multi-currency accounts, and of course Transferwise’s “Borderless” service. It’s going to become harder and harder to bash a bank if, well, you are one.